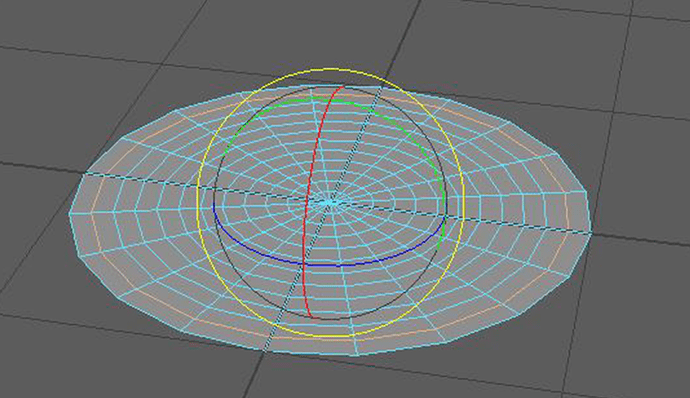 Thank you, and my way of getting the clean UV circle in all likleyhood could be done smarter, but its just the way I found while messing around in Maya. 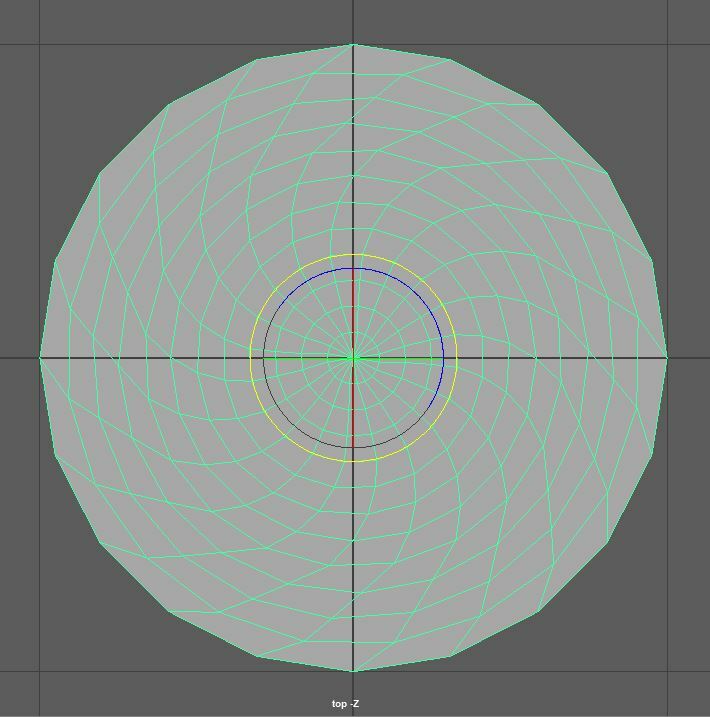 I start the way Shannon Burke shared in her post with a primitive cylinder and taking off the top and bottom face, followed by the use of a flare deform tool and scaling to get the disk shape with clean UV’s. To get the spun up edges, I literally select one of the inside edges and rotate it by hand a few degrees. 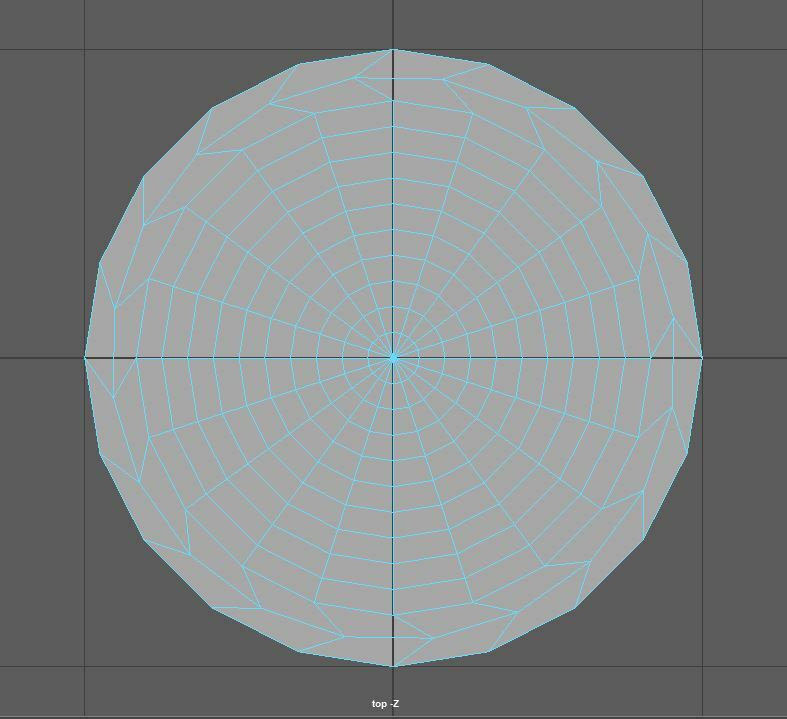 It took me about a minute to do this for all edges of this example mesh. By the end, the UV’s are still clean and super usable for a bunch of effects. Cool effects! 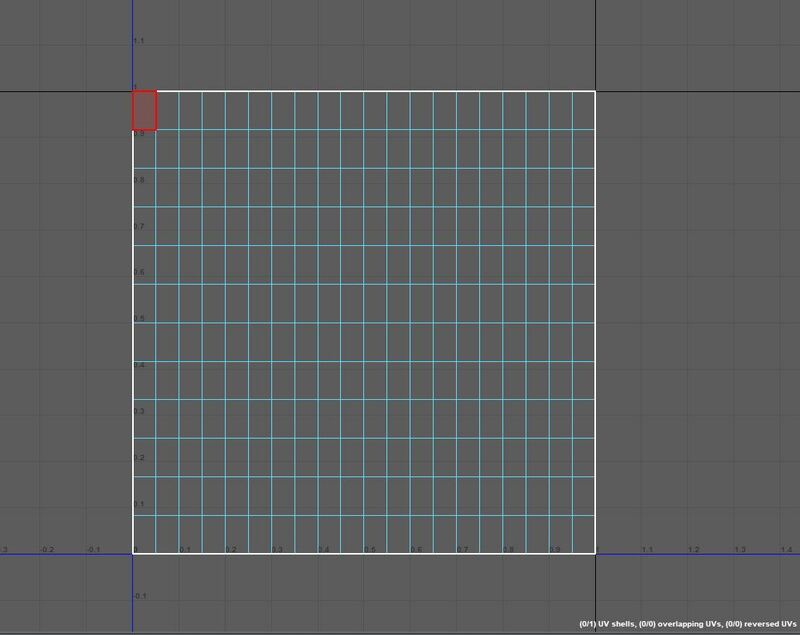 As a note on this technique, in Maya you can use soft selection and just the rotate tool to do the whole mesh at once so you don’t have to go row by row. Just turn on soft selection and select the outer edge (or alternatively the inside point) and rotate. Make sure your soft selection distance gets the whole way, and you can mess with the falloff to get different effects, a linear falloff will make it an even spiral, but some other falloffs can be cool too. Really cool stuff, and i love the rotating UV’s based on Shannon’s technique. I’m curious, for the smoketrail when your portals close, what technique did you use to achieve that? The portal’s wisp of smoke is actually a copy of the orb smoke material I did a break down of before, with slight adjustments. Like the orb smoke material from before, all that it’s composed of is UV distortion applied to a texture and then hitting it with a gradient map to give it the varying shades of purple. Only difference is in this smoke, I amped up the UV distortion amount and swapped out the texture to a longer smoke I drew up in Photoshop. Granted, the smoke doesn’t look great when singled out, but felt right in context. Thank you so much for the detailed explanation, really appreciate it! Sorry for the follow up question, how exactly is the gradient map reference used? i’m having some trouble finding a good source of info on this. No worries, another person asked about the technique as well. Gradient maps are super useful and really easy to implement tool, as seen above. 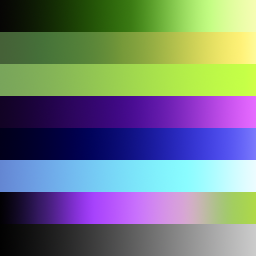 Basically gradient maps can be thought of as Look Up Tables that checks each RGB value in a 256 x 32 image, in this case a color range from black to magenta and finally to a sickly green, and remap the color value of their own color range, in this case from black to white, to match the new color scheme. That sounds like a lot, I know. In this example, we have the black values look at the new gradient map and ask what color they should be, in this instance, a very dark purple. Half way through we have the gray values check and find that they should be magenta, and similarly, the white values should be green. The reason, and benefit, of using the 256 x 32 dimension for our gradient maps is that we can stack multiple maps of different color schemes on top of one another into one mega gradient map, allowing us to save on space and still sustain those powers of 2 that computers love so much. For the Warlock Spell, I made this guy, which includes 8 different maps in a 256 x 256 image. These are really easy to make in photoshop, and a few google searches should get you what you’re looking for. What makes it way more useful is when you use this logic on a texture. Starting from the left, we take our grayscale version of our smoke texture and saturate it, which basically normallizes the RGB values, or set them to range from 0 to 1. 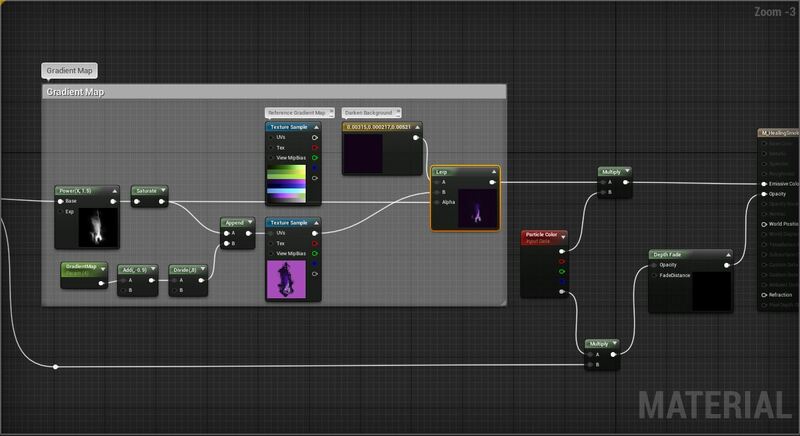 The green node called “Gradient Map” from the screenshot is a parameter I set so that I can easily swap out which gradient map I want to to use at that moment. In this instance want our smoke to be dark on the edges and light pink at the center, so we look at the Warlock Gradient Map and see the 4th row down, the one that goes from dark purple to light purple. Starting from the top, a value of 1.0 would give us the black to green color scheme, while a value of 2.0 would give me the off green to bright yellow color scheme. We input 4.0, remapping the texture we give to now take on the purple color scheme. The floating “Reference Gradient Map” node in the screenshot is literally just there to show me the order of maps, and is intentionally not plugged into anything. And that’s it! TLDR; Gradient maps let you change the color scheme of a black and white texture. 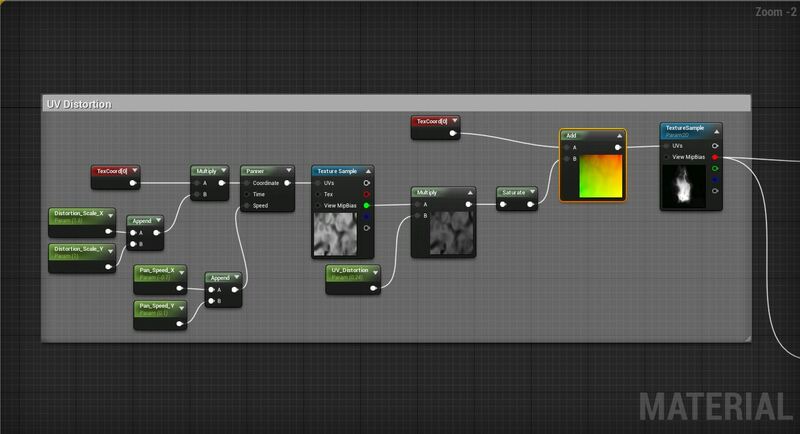 Copy that unreal code and apply it to a grayscale image. This stuff is way easier to get by doing than explaining in text form. Sorry for the delayed reply on this. I really appreciate the in-depth explanation, it helped me out a lot! Obviously this looks fantastic. I too am a student and just got into the vfx field (transitioning from character animation). My only (constructive) criticism would be how flat the beginning portal looks. It doesn’t feel like there’s any depth to it. The smoke around the edges definitely helps though.